4.1 In less fluffy terms, what is this? 4.2 I know a little about Magic. Aren't Planeswalkers super OP? 4.3 I don't know anything about Magic, but I want to learn! 4.4 There are things not in this FAQ I'd like answered! Among the infinite planes of the multiverse, there is conflict. Places exist where mages do battle, using magical energy known as mana drawn forth from the land to fuel devastating spells. Conjured armies clash, and the skies fill with fire and lightning, all in the pursuit of inscrutable goals and mystical power. Evidence of these conflicts remain for years after, be it in the form of terrible destruction, or monuments to the victors power. Or, in the case of one far-off world, a place called Earth, a world that has never seen this conflict touch its soil... it is instead a card game. DECKMASTER is a variant Magic: the Gathering theme that takes place on a present-day Earth that exists within the Magic multiverse. M:tG is a popular card game on that Earth, either intentionally or accidentally chronicling the events of the conflicts all across the planes. When the game is played by certain people across the globe and combined with an emotionally-powerful event, the dormant Planeswalkers Spark within them ignites, allowing them to use their decks to wield real and wondrous power. The following two entries are the themelist-wide staff-approved infolist files. Please see +info Theo /deckmaster1, /deckmaster2, and /planeswalking on the game; these are copied directly from him. Two important notes: First, Multiversal denizens outside of the Deckmaster theme will not be subject to milling or the similar specialized mechanics contained herein. Second, the MUSH's rules for combat and combat etiquette trump a Deckmaster's potential abilities. Consent may be required for many of the spells and powers contained in Theo's decks, and consent will be required to affect multiple opponents. You might be able to throw infinite-damage Fireballs all day long in theory, but in practice, rules for using Uber and Epic attacks in and out of combat should still be observed. Theo is a Deckmaster, a type of spellcaster found on his home Earth who specializes in the use of magic through the medium of the collectible card game Magic: The Gathering. Due to the thousands of unique cards in the game, with each representing a particular spell, Theo's potential power is immense... or it would be, were it not for the serious limitations the game imposes upon him. As a form of ritualized spellcasting, Theo must observe a number of seemingly strange restrictions to draw any magic, lest his power fail him entirely. Theo's spells are drawn from his deck (or library) which must be legal for play within the context of the game, regardless of the situation he's using it in. This means there is a certain degree of randomness to what he can do at any given time, and a limit to how many different spells he can cast in a given battle. It's impractical and unreliable to have a big library in most circumstances, lest he risk failing to draw what he needs to save his own actual skin. On a similar note, the cards he uses must be real and official; due to mystical circumstances surrounding their creation, the official cards function as physical, surrogate spell memories for a Deckmaster, effectively replacing his need to actually personally learn a spell. Instead, he uses the card, which is in and of itself a stunningly accurate representation of the spell in question, and combines it with mana to generate an effect. A Deckmaster must observe the proper order of a game, including timing and turn order, to cast spells. This means that spells that can only be cast during certain parts of a turn still have the same restrictions, and, similarly, that he is restricted to casting spells that he has the mana to cast in-game, regardless of the amount available to him outside of the match. Perhaps most importantly, turn order must be observed, even if his opponent is simply coming at him with a sword drawn. In short, a Deckmaster cannot take action against an opponent if they have nothing to act against. The magic does not function when only one person is playing the game with intent to use it against someone outside of it. There are three notable exceptions to this rule. First, if a Deckmaster is playing a solitary game (often referred to as a practice draw), they may cast spells more or less freely, but may not affect others with their spells. Second, a Deckmaster may continue to cast spells if they have rendered an opponent unable to retaliate through some combination of spells or effects (often referred to as an act of stasis). Third and finally, a Deckmaster may freely act against an opponent if the opponent is deliberately allowing them to build up power (often referred to as a bad decision), though they still must obey personal timing and turn restrictions and allow the enemy to act. The turn- and reaction-based restrictions on a Deckmaster means that they are generally predisposed to dueling, though fighting multiple opponents is possible. Deckmasters may affect as many opponents as they wish with spell effects that are capable of doing so. If they are openly declared as an ally of an individual and are facing an equal number of opponents, they may share certain spell effects with their ally. Finally, if they are faced with a number of opponents all working together and have no allies, they gain a greater degree of individual power (sometimes called becoming an Archenemy, though the term has needlessly sinister connotations) for the purpose of fighting on a more even playing field. Mass combats between Deckmasters and other individuals with no permanent, predetermined alliances are possible, and function as normal; some Deckmasters specialize in such engagements, and adjust their strategy accordingly. Deckmasters win a duel by defeating an opponent through several means, the most common of which is to physically defeat them. Damage is roughly correlated into numbers affecting an in-game life total for a Deckmaster's ease of manipulation, observed through intuition more than anything else. A Deckmaster may also claim victory by removing all of an opponent's possible means of fighting them (called decking or milling), or through more esoteric means that all effectively translate to a win in some respect. Deckmasters themselves are meanwhile no less vulnerable to being physically beaten into submission than anyone else. If a Deckmaster is defeated in a manner that leaves them conscious, their magic leaves them until a new fight starts with them, usually through open acknowledgement of the fact and usually with a different person. The specifics can vary by situation. Lastly, barring things like collateral damage and the like, creatures, objects and lingering spell effects summoned by a Deckmaster in a duel dissipate once the duel ends. Effects that alter another individual once and otherwise cease -- such as the damage from a lightning bolt, or the healing effect of a conjured salve -- still remain. Consent is always required to teleport into any area not under the player's control. Using the Spark to walk between worlds is not as simple as visualizing oneself in a different place, saying a couple magic words, and suddenly being there. There is danger inherent with the ability, and though a Planeswalker's Spark mitigates much of it, the careless still risk suffering if they make a mistake. A Planeswalker travels between worlds by a method unique to each walker. Some draw a circle, meditate upon their destination, and arrive in an identical circle in the spot shortly thereafter. Others sleep and dream about the possible worlds, roaming their own memory until they find the place they want to be, and awaken there rather than where they started. Regardless of the method, the actual transit taking place -- along with the mana required to do it -- is the same. Two things are required for planar travel: a source of mana, and a destination. A 'walker's personal ritual supplies the concentration needed to draw mana to them for the plane shift, while their memory typically provides the destination. The more well-known a place is, the more precise the locale a walker can go to, though vague but real destinations function as well. For instance, travelling to a specific room in a specific city on a specific plane is completely possible, though an individual's familiarity with that room would have to be significant to be that precise. At the same time, a Planeswalker can simply specify "Mirrodin" if they've either seen part of it or been told about it (accurately), though there is no controlling where they'll end up on the plane itself. While Planeswalkers /can/ simply walk "away" and go to a random world, doing so is incredibly dangerous, and typically only done when death is certain if they stay. In practice, Planeswalking requires tangible details to function. The most reliable details are either precise coordinates or a deep, pre-existing familiarity with a location, ensuring accurate travel. Visual aids such as photographs or other images help; they alone can provide a chance to travel to the right place, but the nature of the Multiverse means that it is more likely to end up with a walker stepping into a parallel world with striking similarities instead of their intended destination. Notably, Planeswalkers from Theo's Earth may use land cards to go to particular planes with some degree of accuracy -- for instance, using a Boros Garrison card to end up in the desired district of Ravnica -- though doing so does not necessarily guarantee safety like a familiar, pre-determined destination would. This quirk stems from the process by which the cards were created, and should lands identifying Multiversal locations be produced, they would function the same way. Deckmaster PCs all have +info files set with basic information about their decks and links to where they are visibly hosted online so that Admin and others may read them. Listed below are the current and dropped PCs as well as their general deck color-schemes. Conor Delany: The differences between White and Red, combined. Yumi Musumi: The wild freedom of Red and Green, played. Neva Fernandez: The explosive combination of Red and Blue. Tommy Wahagi: Submit to Phyrexia and evolve beyond your limitations. No Deckmaster characters have been apped and dropped at this time. In less fluffy terms, what is this? 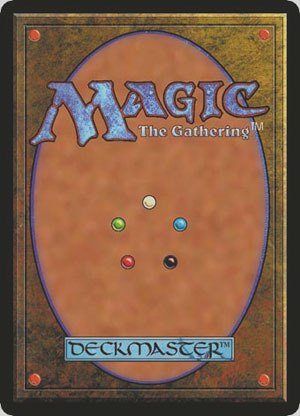 Deckmaster-1 is a theme that takes the overarching meta-theme of the collectible card game "Magic: the Gathering," adds in a healthy dose of style from various card-battle shows, and sets it on a modern day Earth. The player characters are the eponymous "Deckmasters," individuals capable of incredible magical feats that are entirely enabled by the game they play. I know a little about Magic. Aren't Planeswalkers super OP? They used to be, yes. Key words: 'used to be.' Planeswalkers in Magic: the Gathering were formerly beings of godlike power with no permanent physical form, immunity to nearly everything but other Planeswalkers, perfect shape-shifting, and whatever else a given 'walker was written with. Ever since a particular event in-theme, their power has been drastically reduced, making them all powerful (and mortal) mages. No more OP shape-shifting energy beings here! I don't know anything about Magic, but I want to learn! Great! If you have a few bucks to spend, I highly encourage people interested in the game to check out the Duels of the Planeswalkers games on Steam. Magic 2014 is the newest one, and I'm told it is a solid game and a good way to learn. If you don't, most of the people in the theme are well-versed in the game enough to teach it if you ask us nicely, and big enough fans of the settings involved to give you the over-enthusiastic cliff-notes on various planes and thematic elements. There are things not in this FAQ I'd like answered! Ask Theo. It's all his fault.